Valerie Boyd is one of the strongest women I know. Fiercely independent, passionate in her defending her views. Certainly, an inspiration to me, ever since I met her years ago at the Atlanta Journal-Constitution. I admired her talent, her tremendous writing skills, her astuteness as an editor. I especially felt a bond with her at a time when there were not too many women of color working in mainstream newsrooms. So when I went to teach my magazine writing class at UGA (a job for which Val recommended me) more than two weeks ago and found out she had been hospitalized with pneumonia, I grew worried. After I received a message from her partner, Veta, I understood how serious Valerie’s situation was. She was in the intensive care unit, sedated, intubated, on a ventilator. For days, the update on Val’s status sounded like this: She is getting better but she is still on the ventilator. I thought of my own mother, who had been on a ventilator for the last three weeks of her life. When she died, I saw her chest still heaving on that machine and for a moment, believed that the heart monitor was wrong. How could she be breathing still when the monitor indicated her heart had stopped? I learned later that she had been kept on the ventilator until her doctor could order it to be shut off. It was one of the most horrifying moments of my life and an image that stays with me always. I imagined Valerie, at DeKalb Medical Center, gasping for air, on that ventilator. It was unnatural. She was too young to die like this. She has so much more to give to the world. The strong-willed woman that she is, Valerie fought pneumonia like a soldier in battle. She wasn’t going to succumb to something that robbed her of her independence. She was deemed well enough to breathe without the machine a few days ago and moved into a rehab part of the hospital Monday. When I went to see her Tuesday evening, she told me she had thought much about death. It was not in the natural order of things for her elderly father to plan her funeral. It was she who should be doing that for him. She told me of her dreams in her frail state. How she had seen my parents as children again; that they were with me once again on this earth. And of all children of color, who fight every day for survival. Valerie’s near-death experience has made her cherish more all of life’s beautiful things — the sunlight and the birds, a slice of fresh pineapple (yes, she was craving slushy fruit), walking her dog. How strange she had felt that someone had to help her to the commode or watch her take a bath for fear she would fall. I suppose most everyone who skirts death has similar thoughts. But Valerie articulated them from her hospital bed with the clarity and haunting beauty of her language that is familiar to all who have read her work, especially her biography of literary giant Zora Neale Hurston. In the drabness of hospital hues and in a strained voice that sounded like a 90-year-old chain smoking man’s (we joked), she talked of her verve for life. Yesterday, it was Valerie who was wrapped in rainbows. I left her room at dinner time, walked back through the halls of a chaotic hospital where suffering knows no end. And yet, a calm settled on me and once again, I knew I was better for having seen my friend. And thankful that there would be many more meetings to come. Thanks goodness your friend is okay. What a beautiful recollection of the past few days. I believe what she saw was real. we will be united with our loved ones, atheists be damned. Love you Dink. Something truly amazing and miraculous happened in 27 days at DeKalb Medical Hospital. Valerie Boyd, sedated and intubated, communicated. 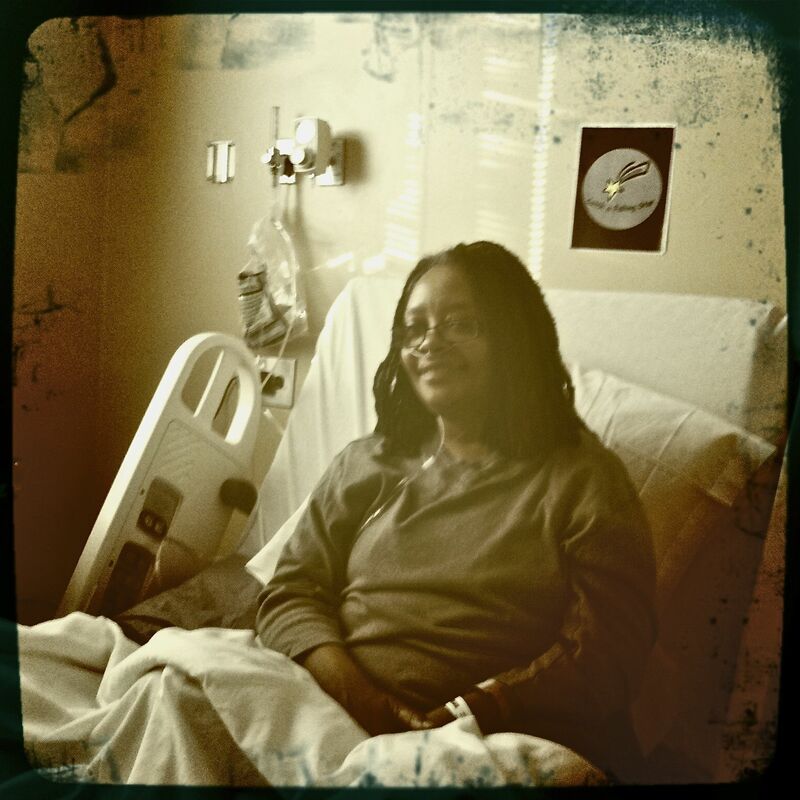 Through fluid-filled lungs and Propofol haze, Valerie wrote and we laughed and cried. We held her IV’d and swollen hand against the reporter’s notebook so she could ask us what day it was, request to be turned or tell us the nurses and technicians were treating her well. Although a machine was breathing for her, Val joked through the discomfort, her writing sometimes trailing off the page and onto her other hand; at other times, she wrote one sentence on top of the other. There were many instances when we could not understand what she was trying to say. We felt so inadequate. But she never stopped – she never gave up. And, she wrote, ‘I love you’.What was amazing? Through those 27 days, even when she couldn’t speak, Valerie never lost her voice. And now that she can, there is no sweeter sound. Thank you, Moni, for acknowledging our friend Valerie. I felt like my heart was tied in knots for most of the time she was on that ventilator. Like you, I could not imagine that the world could still be whole without her in it. We have been friends for more than 20 years and I understand now how I have come to depend on that quiet friendship, that steadfast love. It has made me reflect on and reconsider many of the relationships that I think I am much, much too casual about. My mother has been telling me for years to make sure that you love the people you love, actively. Now I'm starting to get it. Oh, and I am glad that she was able to communicate something to you about your parents. What a gift. this is amy from hoopla! I truly enjoy how you listen and learn stories of peoples lives. I loved reading about your trip and am an eager new follower! Now I gotta catch up on what you have already posted. Very nice.